Another day, another pampering time! As you may know from my last week post I just done my hair treatment. 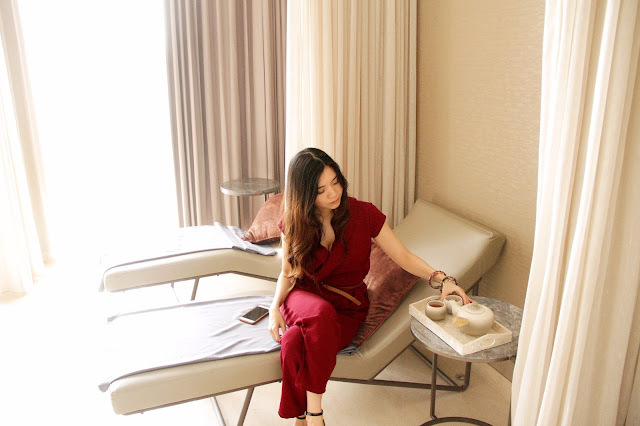 Of course it's not complete without full body treatment ;) So few days ago, I went to Mövenpick Resort & Spa Jimbaran Bali to get pampered at their brand new Arkipela Spa & Wellness, a blissful sanctuary of wellness that showcases Indonesia's rich wellness heritage. Arkipela is taken from the word of 'archipelago' which means a group of island. Honouring a mystical culture rooted in physical, emotional and spiritual balance, Arkipela Spa invited guests to a journey across the ancient wisdom and wellness traditions of Indonesia. We were welcomed with a beautiful Indonesia contemporary interior with Balinese design. The ambience is so nice and peaceful. There's also an apothecary blend bar in the lobby to create hand-crafted remedies from local fruits, herbs, and roots from the age-old herbal medicine recipes passed down from generation to generation. As usual before spa treatment, they asked me to fill in the form about my basic profile, health and allergies. They also asked which part of body that you want to get focused on the massage and also which part of body you don't want to get touch. I prefer to get focused on my shoulder, because I often feel sore in that area. Our body is like the ocean, when the water flow is weak life becomes stagnant, when it is overabundant it leads to flooding. In our bodies this creates a back-log of stress, stored emotions (which is often happens to me) and stagnation. 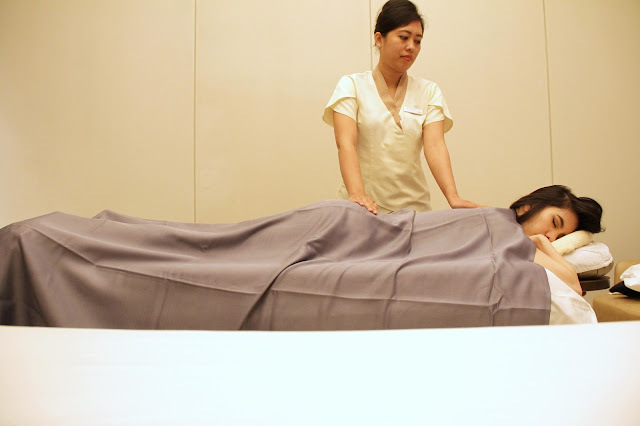 So, for this time treatment, I chose Signature Treatment which is designed exclusively by Arkipela Spa to ease muscle tension and stagnation, improve circulation and flexibility, balances the body and mind, also provides a sense of lightness and improved well-being. Combining Balinese, Lomi-Lomi, Swedish, Acupressure and Yoga-inspired movements, to restore balance and leave you feeling light and revitalized. Wow, can't wait to try! Moving to the exciting part! First impression with the Hallway is just Wow! The Hallway interior into the treatment room is really beautiful and mesmerizing. 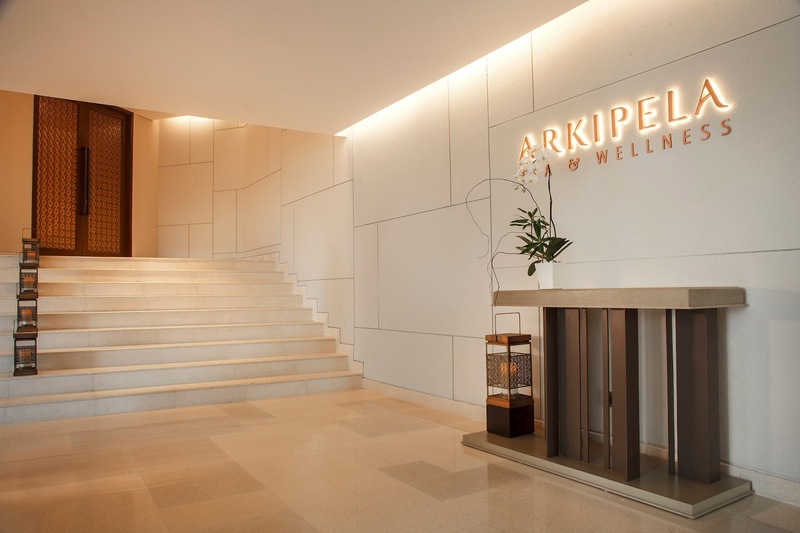 Arkipela Spa which the design inspired by the water where we can see the floating water on the hallway and the chandelier which looks like water drop and replica of ancient artifact from Indonesia to support the archipelago essentials. They started with cleansing my feet with salt, lime and soap gently. After awake from the massage, the ginger tea is already waiting for us in the lounge room. The lounge room is also cozy and complete with the view. Usually, we're done here, but no, our journey hasn't finished yet! Next, I was guided to the side of the Spa's lobby and surprise! There's a connecting stairs to Movenpick cafe right there in the Samasta Lifestyle Village! Ice cream, cakes, any dessert of your favorite, you choose! 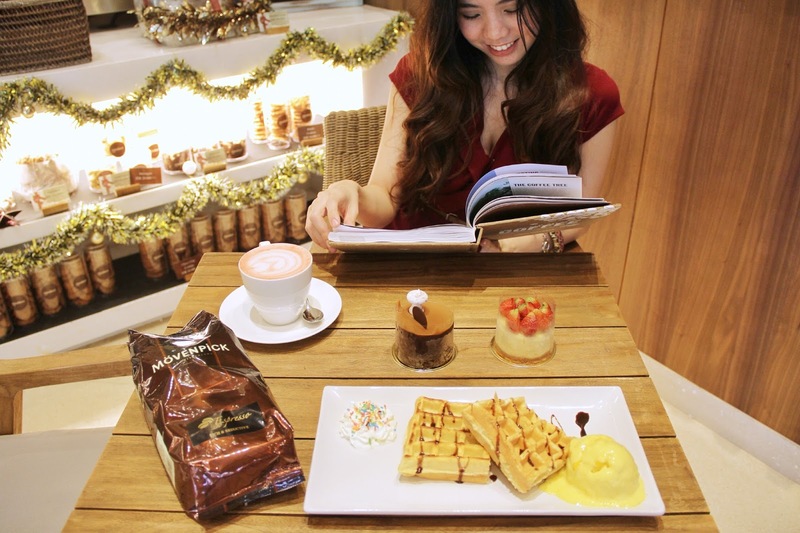 Red Velvet Latte, Waffle with mango ice cream, cheese cake, coffee, what a perfect day! I recommend to try the Red Velvet Latte, it taste sooo good 10/10! Such a great place to hang out, chit-chat with your friends, bonus good pictures everywhere! I feel very pampered here, after the amazing massage and a wonderful tea time, surely I will come back soon! In real life, it's even more beautiful! This spa looks so amazing! I would love to relax here. This spa looks amazing. I love your jumpsuit too, fabulous! I'm so jealous about all that dessert! This spa seems like such a relaxing place! This place looks like an amazing location to be pampered. I need some me time at a resort as well. this looks like a place i would like to visit. i need some pampering. Oh wow, this is just perfect! I plan to go to Bali and definitely including spa sessions in my itinerary!